Average overall ratings - Based on 9546 reviews. The region of Valencia, which is also known as the autonomous community of Valencia is located along Spain’s Mediterranean coastline, overlooking the Gulf of Valencia and surrounded by a rolling mountain range and vast plains filled with orange groves which lead to the lands of Aragon and Castilla-La Mancha - the region made famous by Cervantes’ Don Quixote. The Valencian Community has an enviably mild climate with nearly 2,700 hours of sunshine, which makes it ideal as an all year round destination. Hot summers and mild winters are interspersed with windy autumn and spring months. In the fifteenth century, Valencia witnessed its golden age, when political autonomy was granted by the Aragonese king, James I. Trade boomed in the region and it also became a cultural hotspot, with many writers and poets residing in the area. Thanks to the high ambitions of its rulers, the capital Valencia became one of the most influential cities of the Iberian peninsula. 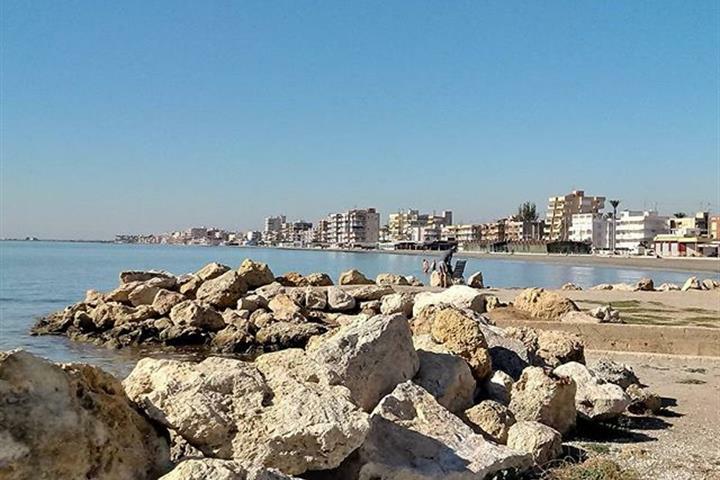 The northern part of Valencia’s shoreline which consists of the Costa del Azahar and the Costa de Valencia boasts long, sandy beaches, towering apartment buildings and countless resorts. This infrastructure shares the landscape with farmsteads and large market gardens. The most important city of the Costa del Azahar is Castellón, a beautiful town with its own airport. With any of these holiday villas in and around Castellón you can enjoy everything the city has to offer! View our range of self-catering villas on the Costa del Azahar. The Costa de Valencia is the coast closest to the capital Valencia, a city with a rich heritage and great attractions and the perfect city trip destination. The Costa Blanca (one of the most well-known coasts of Spain) is situated in the south of the autonomous community. It gets its name from the many beaches with fine white sand in the area. Another one of its natural features are the numerous lakes, such as the lake of La Albufera and the pink salt lakes of Torrevieja. Within the Costa Blanca you have the Marina Alta region, with capital Denia. 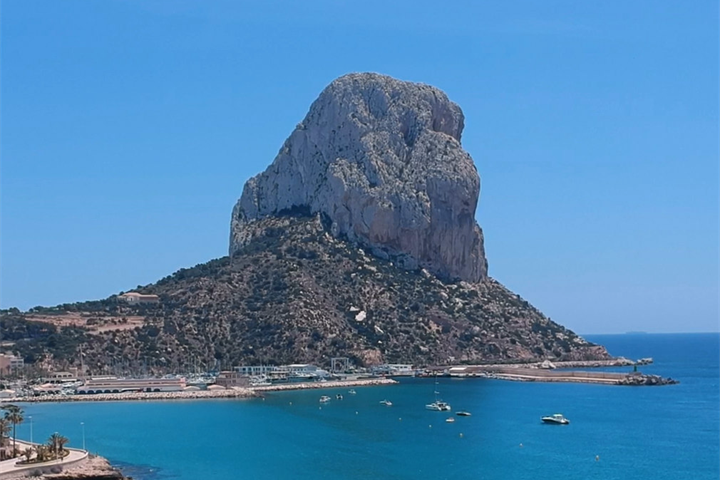 The region has everything you could want for an action-packed holiday (history, excellent beaches, beautiful natural parks), a stay in a holiday rental in Denia would offer you the perfect base to explore the area. The Marina Baja region is known for its impressive nature, such as the Algar waterfalls and Guadalest. 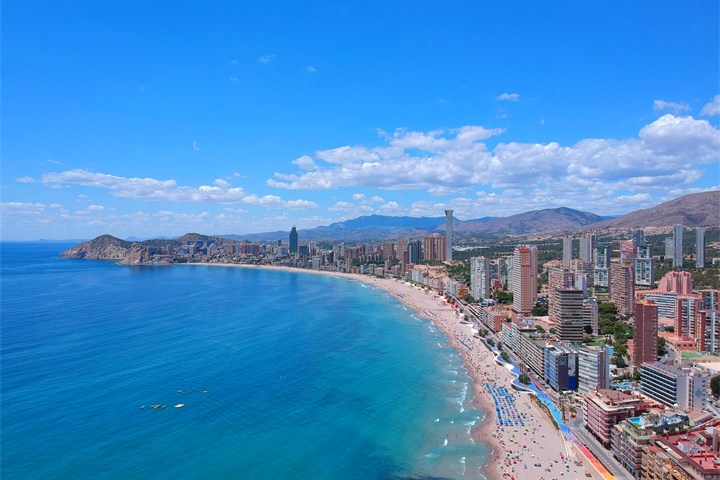 The most important city in this area is Benidorm, famous for its beaches and nightlife. Take a look at our holiday villas on the Costa Blanca. La Safor, a region of the Costa de Valencia, deserves a mention of its own. It is an attractive area characterised by high mountains and woodland. One interesting place to visit is the Monastery of Sant Jeroni de Cotalba, one of the most historic religious constructions in the Valencia region. The coastline offers beautiful beaches and seaside towns such as Gandia. Check out our holiday homes in Gandia. The beaches in the Valencia region are very high-quality with excellent facilities and water sports equipment to rent. This is one of the reasons why Valencia is such a great family destination. Most Valencian beaches are awarded the Blue Flag every year for their outstanding quality and safety. Typical local produce of the Valencia region includes a wide variety of sausages, confectionery, rice and citrus fruits. And don’t leave without trying the delicious red and white Valencian wines. Paella is the typical Valencian dish and the most famous dish of Spain. The traditional paella is made with rice, rabbit or chicken and vegetables, but each village in the Community has its own variation made with fresh and local ingredients. The three most popular varieties are the meat paella (with chicken or rabbit), the seafood paella and the mixed paella, which combines meat and fish. Another Valencian dish is arroz banda which consists of rice cooked in fish stock served with seafood and aioli. In the region of La Safor the traditional food is fideuá. It is similar to a seafood paella; the only difference is that it is made with thin, short noodles instead of rice. In Calpe you can sample llauna de Calp, another seafood paella with a twist. The ingredients are very similar, but they substitute rice with potatoes. Have a look at our selection of holiday apartments & villas in Calpe for a culinary holiday with a difference. In Los Serranos you may also like to try olla churra, a stew made with pork or lamb and black pudding, or a dish called gachas, a type of porridge. If you are a meat lover, then you will love the delicious, yet simple dish of lamb chops cooked over an open fire, or the wide variety of sausages that are typical of Valencia, such as longaniza (with black pepper), black pudding, and of course chorizo. As with much of Spanish cooking, many traditional dishes have their origin in home-cooked recipes, including fried chicken or rabbit garnished with tomato sauce, and the popular hervido, green beans cooked with potatoes and served with oil and vinegar. Valencia is also famous for its sweet pastries and breads: panquemados (brioches with anise, cinnamon and lemon), Valencian doughnuts, turnovers, coconut cakes, anisette rolls, almond rosegons, egg-rings for Easter and Epiphany rings. As for drinks, orgeat or horchata, a refreshing drink made from earth almonds, is a typical beverage. It is served ice cold, like a milkshake. Another Valencian drink is agua de Valencia, which is made of orange juice mixed with cava. Since Valencia has over 75,000 hectares of vineyards, it is no surprise that the region produces many excellent wines. The main cellars are found in Requena, Utiel, Llíria, Villar del Arzobispo and Tuéjar. Requena also produces high-quality cava. All of these cellars are located inland, but if you want to enjoy the beach as well we recommend to choose from one of these villas and apartment rentals in the Alicante province, where there are many vineyards relatively close to the beach. The biggest and most important festival of Valencia is Las Fallas, the traditional festival of Saint Joseph. Between the 12th and 19th of March, the people of Valencia take to the streets which are filled with towering statues that have been a year in the making. All day and night crowds of locals and foreigners fill the streets, admiring the different statues and enjoying various concerts, fire shows and other activities. At the end of the week, the huge statues are awarded prizes and then set on fire, which marks the end of Las Fallas and the beginning of spring. Every town in the Valencian Community also has their own unique festivals, especially in summer. For example, the traditional Moros y Cristianos Festival is celebrated every June in Moraira. Check out a great selection of villas and apartments in Moraira that are perfect to visit this colourful festival. Valencia city is famous for its nightclubs where the music plays until dawn. They are situated on the outskirts of the city and on the road from Valencia to Cullera. Benidorm is another city that is well-known for its nightlife. View beach villas and central apartments in Benidorm and discover the best clubs and bars in the city. There are many golf courses throughout the community. In and around Valencia you have the magnificent El Saler Golf Course, the Oliva Nova Golf (designed by Severiano Ballesteros), L Escorpion in Betera, Manises and El Bosque in Chiva. On the Costa Blanca, Orihuela is the perfect golf spot. With over 10 golf courses you will not be bored! Book a holiday villa in Orihuela Costa and tee off on a great golfing holiday. The 112 kilometres of Valencian coastline offer countless opportunities for leisure and sport. Lovers of nautical sports will find everything they need strategically placed along the shoreline. Almost every town offers some kind of water activity! Especially the Costa de Valencia is home to important sports centres and ports. Principal nautical sports centres can be found at Canet d’En Berenguer, Pobla de Farnals and the Valencia marina (situated inside the Port Saplaya Estate). 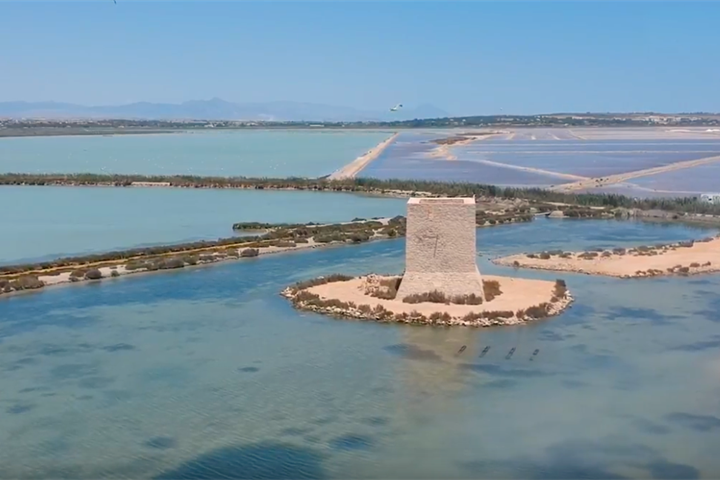 Valencia has its own Royal Sailing Club, in Sueca, and there is a sailing complex on the canal in La Albufera and Cullera at the mouth of the River Jucar. Gandia and Oliva are two other towns with important sailing centres. For an amazing sailing holiday, rent a holiday home on the Costa Valencia. You can practise many adventure sports in Valencia, ranging from hiking (on the GR-7 and the GR-10 for example), touring by bicycle, abseiling in the gullies and canoeing to horseback riding, gliding and paragliding. Altea, for example, is a great destination for thrill seekers. Take a look at our wide range of apartments and villas in Altea. Of course you can practice plenty of other sports, including traditional sports such as pelota (similar to netball), at one of the many facilities available. The Valencian Community is well known for its ceramics industry, with the province of Valencia as the most important producer. The town of Manises is the undisputed traditional centre of production. The famous firm of Lladró in Tavernes Blanques is another hub of local porcelain production, and they export all over the world. Browse through all of our holiday rentals in Valencia province and find out how these artisan products are made. The towns of L’Olleria and Llosa de Ranes both have many workshops crafting handmade glassware and wooden furniture. Artisan wooden furniture and other items are also produced in Alboraya, Xirivella and Torrent. In Sagunto the specialty is handicraft in cork. The towns of Aldaida, Alacuas, Godella and Valencia show fine craftsmanship in fan making, going from the simplest designs to the most sophisticated fans available in Spain, made with mother of pearl. Santa Pola is a great place to holiday on the Costa Blanca. Discover the best things to do and see and experience the holiday of a lifetime. 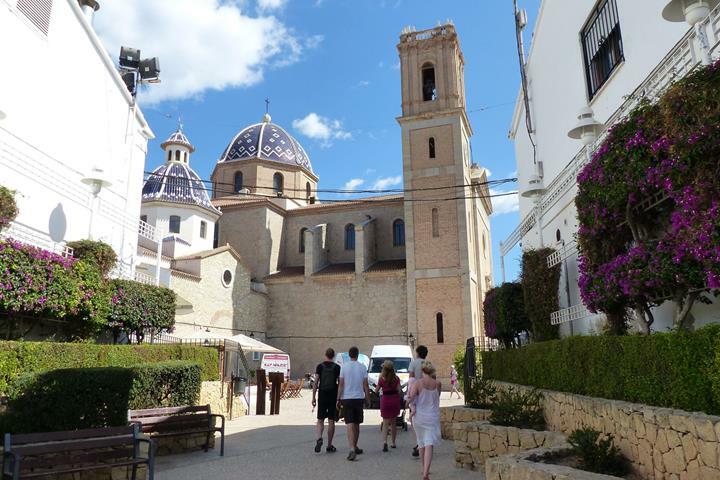 Discover why Denia is one of the most fascinating destinations on the Costa Blanca. This lovely town offers many interesting visits and activities. Find out the best things to do and see in Costa Blanca hospot Calpe. 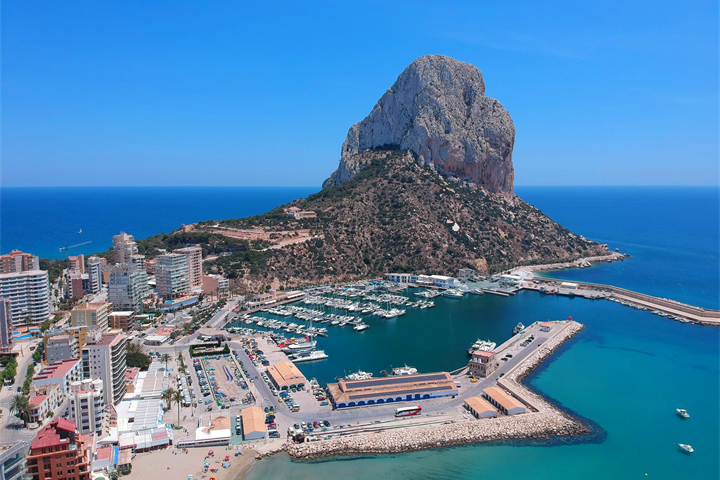 From its emblematic rock to its fishing tradition, Calpe has a lot to offer.